Andreas Acrivos (NAE-1977, NAS-1991) has long been an active member of both the National Academy of Engineering and National Academy of Sciences, serving on many committees over the years. However, Acrivos counts his service with the National Academies of Sciences, Engineering, and Medicine work on human rights as among the most rewarding. 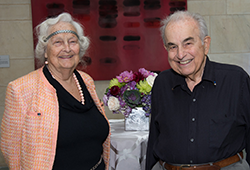 Recently, he and his wife, Juana, named the Academies as a beneficiary of their estate to support these efforts in the future. Acrivos first learned of the Academies' human rights effort during his attempts to help Richard Hercynski, a colleague and friend from Poland with whom he served as co- principal investigator on a research project. In 1988, Hercynski, who had been under surveillance by the Polish government, was suddenly arrested and imprisoned for showing "disrespect to his government." "I was completely taken aback, and, although I was anxious to help, I had absolutely no clue on how I should proceed, "Acrivos said. Then he discovered the Academies' committee, which uses the influence and stature of the Academies and their members in support of researchers anywhere in the world who are subject to severe repression for peacefully exercising their internationally recognized human rights. The committee agreed to adopt Hercynski's case, which greatly improved his living conditions as he served his two-year sentence. "The word quickly spread among his guards that he was somebody very special who had 'friends in high places,'" Acrivos said. Shortly afterward, Acrivos became a member on the National Academies of Sciences, Engineering, and Medicine committee and participated firsthand in helping many more researchers under oppression. "When meeting somebody whom the committee had succeeded in liberating, I always felt a sense of accomplishment that, somehow, I had played a role. My wife and I did not hesitate to include this cause in our charitable contributions. "